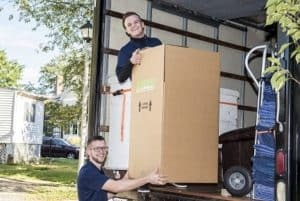 If you are moving between state, you might want to enlist the help of a professional interstate moving companies in Washington, DC like Suburban Solutions. Whether you are moving one state over or across the country, there will be many details to take care of. This means you should research all of the available interstate moving companies serving Washington, DC to ensure you choose one that offers the services, experience, and resources you need for a successful move. The items that you want to keep can be put aside for packing. Those that you no longer use should be donated or sold. This will leave you with the pile which you are unsure about keeping. Now you can reexamine these items and decide whether or not you really need or want them. Repeat the process until you’re left with the first and third pile. Organize Your Belongings – Between 4 and 6 weeks before you move, begin to pack up any items that you won’t be using until after the move. Label the boxes and put them aside. If you’re unsure how to pack, you can stick to organizing the items and then ask the interstate moving company to pack them accordingly. Arrange to Turn Off Utilities – Between 2 and 4 weeks before you move, contact your utility and subscription service companies to notify them of the move. Make sure you schedule a turn off date. If you’re renting or selling your current home, you may want to consider hiring a cleaning company to give the residence a deep clean. This can help you to get back your lease deposit or attract new buyers. Be sure to ask different moving companies in Washington, DC about their cleaning services. There are many other things that professional moving companies in Washington, DC can do to make your interstate move successful. To learn more, or to receive a free quote, please call Suburban Solutions today!